Operating as a nongovernmental organisation (NGO) in Egypt is no mean feat. Aside from the fear of further crackdowns following last week’s raids and what civil society groups are calling a government-led “smear campaign,” advisory council spokesperson Mohamed El-Khouly on Wednesday urged Egypt’s ruling Supreme Council of the Armed Forces (SCAF) to issue a law further regulating the already carefully monitored activities of NGOs. Most groups are on guard. 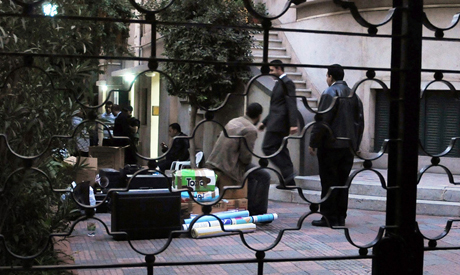 The fear of investigation is so keenly felt that Ahram Online has received several reports of civil society groups sending staff members home for the week, encouraging workers to remove all personal belongings from offices, and duplicating and securing key files and documents. Many groups who initially spoke out against the police raids on NGO offices are now declining to comment. On Tuesday, the German government announced it would send a special envoy to Egypt because the German Konrad-Adenauer-Stiftung Foundation had been raided. In the latest development, prominent civil society workers and activists (including some whose offices were raided) are set to take legal action against Egypt’s Al-Wafd newspaper following unfounded allegations published in its online edition that the groups had received American funding. The offending article referenced a US diplomatic cable, recently published by online whistleblower Wikileaks, which documented several meetings between Egyptian NGO activists and American diplomats. Daily News Egypt reported on Tuesday that the editor of Al-Wafd’s online news portal, Adel Sabry, had admitted to inaccuracies in the article on a television talk show. Nevertheless, the piece, entitled ‘‘Wikileaks announces the names of those who got American funding”, remains online. Interestingly, the Egyptian police website ( www.egypolice.com), an informal webpage run by the media office of the Ministry of Interior, picked up the Al-Wafd story and – despite both parties having access to a translation of the Wikileaks document – simultaneously published a post entitled, “Urgent and surprising… Wikileaks announces on its website the activists and politicians that had American funding.” The fact that a website claiming to represent one arm of the Egyptian security apparatus is taking the (factually incorrect) state party-line of a supposed “opposition” party newspaper is concerning. Ali believes the action taken against NGOs is likely to escalate. “They may even take some groups to court and imprison NGO workers,” he told Ahram Online. Ali also fears his organisation will be targeted as it is mentioned in a recent government fact-finding report. The list includes the three American NGOs – the National Democratic Institute (NDI), the International Republican Institute (IRI) and Freedom House – that were raided last Thursday. Foreign funding has also been another reason to target NGOs, which, again, must be approved by the Ministry of Social Solidarity. In August, the Supreme State Security Prosecution launched investigations into foreign funding allegations, warning that groups could be charged with high treason, conspiracy against the state and compromising national security through the implementation of foreign agendas. This is despite the fact that the Egyptian Armed Forces receive $1.3 billion in annual military aid from the US in an agreement that links Egypt to Israel’s US aid package. Bypassing legal means of funding can sometimes be the only way to work effectively on the ground, civil society workers say, forcing NGOs to violate the law and encouraging corruption. The legal situation for these NGOs leaves them in a precarious position, as outlined in a complaint letter written by civil society groups to the Office of the United Nations High Commissioner for Human Rights (OHCR) following the recent crackdown on NGOs. The 2003 legislation, which the letter says is systematically vague and has not been updated since the fall of the Mubarak regime, states that NGOs can only be created with approval from the Ministry of Solidarity (see Article 6). Article 17 of the law confirms that all receipt of funds must go through the ministry, while articles 34 and 42 give the Ministry of Social Solidarity and the security apparatus the right to object to board elections and disqualify candidates from the board. It also gives them extensive rights to dissolve civic associations. The document cites the treatment of the New Woman Foundation as a recent example of ministry interference in the work of NGOs. The ministry was able to reject a prestigious international award the foundation had received on the grounds that the foundation was advocating for a new law conforming to international standards, which the ministry claimed was outside the remit of NGOs. The purpose and details of last week’s raids on NGO offices remain unclear. Abu El-Naga, who appears to be the spokeswoman for the crackdown, gave no clear explanation as to why this particular group of civil society organisations had been chosen. The initial number of offices targeted was set at 17, but was then reduced to ten in the national and international media. Until now, Ahram Online has only been able to confirm seven. No official list has been issued. Ahram Online can confirm that the targeted organisations are the NDI, the IRI, Freedom House, the Konrad-Adenauer-Stiftung Foundation, the Arab Centre for Independence of the Judiciary and Legal Profession (ACIJLP), the Budgetary and Human Rights Observatory and the Future Centre of Judiciary Studies. There are some obvious political motives behind the choice. The three American organisations are on the NGO hit-list drawn up by the Ministry of Justice. The Budgetary and Human Rights Observatory has been campaigning against the secrecy of the military budget – a controversial topic and one of the main features of the SCAF’s supra-constitutional proposal. Nasser Amin, ACIJLP director and Helwan parliamentary candidate, recently filed a court case because of potential vote rigging. Civil society groups also question the use of paramilitary troops rather than normal police officers and the bizarre behaviour of the security forces, which included confiscating a water boiler, inspecting bathrooms and looking at a roof. Several of these groups have been operating since 2005 – so why raid them now? Then, in a televised interview with Abul-Naga, the government claimed the SCAF had no knowledge of the raids. Why no investigation into Salafis once again? Official government figures show they got the most money of all from foreign organisations. Yet again SCAF siding with the Islamists - but you can't reason with a mad dog. He'll bite you eventually. The main winners from American money? SCAF! Billions of dollars. Investigate yourself! Promotion of extremists and assaults on democrats. And the Prime Minister wonders why the West and the Arabs haven't funded Egypt. Would it not have been better to side with the liberals and the revolutionaries from the start? Where do SCAF think turning away from democracy into extremism will place Egypt? Do they really want civil war so they can have another Mubarak? Would that really be worth all this? The cable in question, where the American embassy writes that it supports Egyptian NGOs, is from 2010, when Mubarak ruled. Does SCAF see the toppling of its former leader, the dictator Mubarak, as treason? Yes of course all Scaf generals were happy with Mobarak.Did any generals resign? or even thought about that!!!!!!!!!!!!! !